Check out the Northwest's largest recreational vehicle (RV) show. 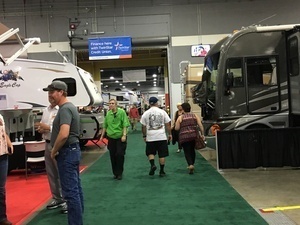 With more than 20 dealers under one roof at the Portland Expo Center and hundreds of RVs, trailers and campers on display, the Portland Fall RV & Van Show celebrates its 35th year. They're all here: Class A, B and C motorhomes, travel trailers of all sizes and descriptions, toy haulers, fifth wheels, campers, pop-up and tent trailers and tow vehicles. On-site financing will be provided by Twin Star Credit Union with special show-only rates. If you're shopping for a new or used RV, this is your chance to land the deal of the year. There is a 2-for-1 discount coupon available through www.pdxrvshow.com. $10 per adult. Parking is $10.